This pub is in Rainow, adjacent village to Bollington! Standing on the boundary of the Peak District National Park, the Robin Hood is the only remaining pub in the village of Rainow. 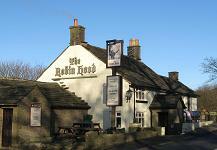 The Robin Hood is a very pleasant, cozy, pub with a good sized restaurant serving good food. It is a Punch Taverns house. October 2017: Scott and Jackie have now settled in to the Robin Hood and look forward to welcoming everyone to the pub. Four B&B rooms. All with en-suite, TV, coffee and tea making facilities. Brews: Good cask ales; Black Sheep is the regular, two others from the pub company’s list and other local beers including beers from Macclesfield brewers Red Willow and Storm. Food: Good food at lunch (Friday-Sunday) and dinner. A slightly restricted choice at lunch time but you are sure to find something you’ll like. Selection of sandwiches also available at lunch time. Other facilities: Popular children’s play area at the top of the car park.Four En-suite Double or Twin bedrooms at reasonable prices make this an ideal over-night location for scenic breaks in the Peak Park! Finding it: Rainow village can be reached from Bollington either via Ingersley Road and Blaze Hill – turn right at the Lookout crossroads onto the B5470 and the Robin Hood is a mile down on the right – or via Windmill Lane – turn left on the B5470 Macclesfield/Whaley Bridge road and follow it through much of Rainow village until you see the pub on your left. The entrance to the car park is in the lane off the main road.